Barbecue and bourbon—two of the culinary pleasures I love most. So when I saw The Perfect American Pairing: Bourbon & BBQ, I knew I had to get there. 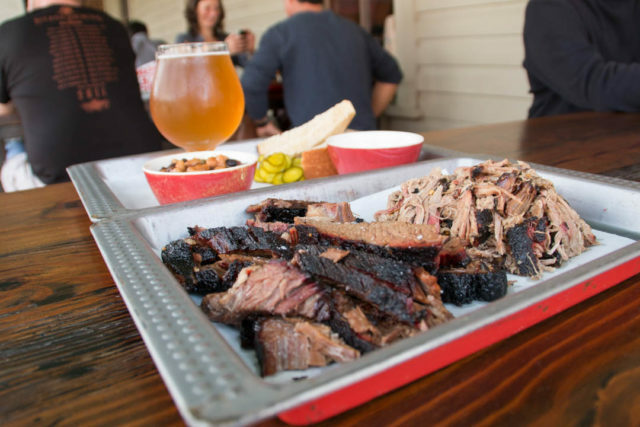 After all, inquiring minds wanted to know: why does bourbon go so well with barbecue? 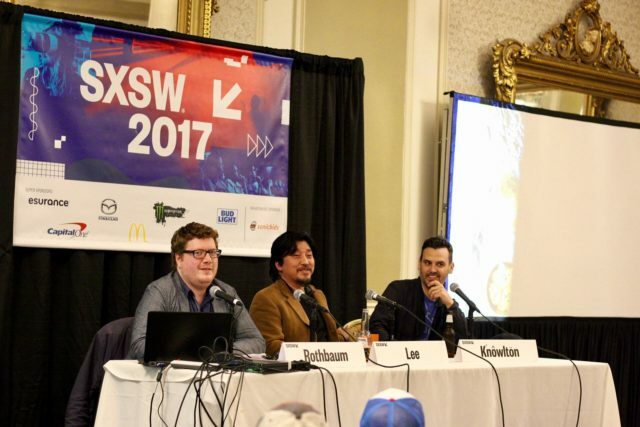 The panel consisted of Noah Rothbaum of The Daily Beast, Chef Edward Lee of 610 Magnolia and Andrew Knowlton from Bon Appétit. As opposed to many SXSW panels that seem contrived and overly scripted, the group was at ease and conversational. I credit a lot of that freewheeling nature to Knowlton, who I previously saw at SXSW. The awesome panelists at the SXSW 2017 session on BBQ and bourbon. From left to right, Noah Rothbaum (The Daily Beast), Chef Edward Lee (610 Magnolia) and Andrew Knowlton (Bon Appétit). Photo by Garrett Heath. While barbecue and bourbon is en vogue today, it’s actually more of a modern pairing. Traditional market-style barbecue lunch (with a house brewed Saison for good measure). Photo by Garrett Heath. Thinking about my own personal experience, this also holds true. Barbecue was typically associated with church lunches or family get-togethers, which didn’t typically have the distillate present. When we would eat barbecue out, you were far more likely to find a tap of Coors Light than a bottle of Evan Williams. So why did the change happen? The panelists said that there are a couple of things to consider. First, cocktails and spirits have historically been consumed before or after a meal with wine being present during the meal—this is because the spirits are just too overpowering for the food. 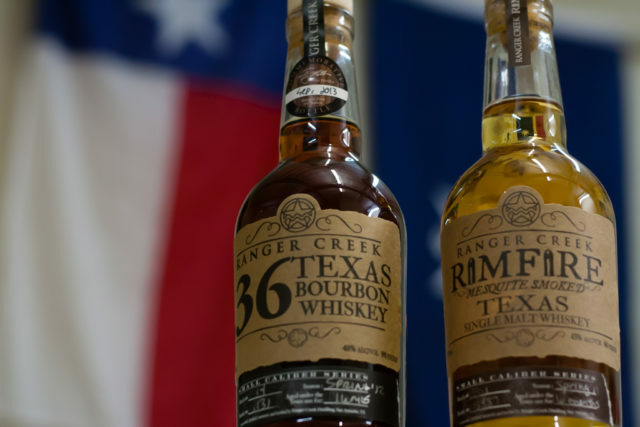 Ranger Creek’s .36 Texas Bourbon Whiskey and Rimfire Mesquite Smoked Texas Single Malt Whiskey. Photo by Garrett Heath. Second, the fact that smoke is a flavor component in both bourbon and barbecue makes them play off each other well. Naturally, when a brisket is smoked there are going to be a lot of flavors imbued from that process. With bourbon, one of the main requirements for classification in that category is that it must be aged in a charred, new oak barrel. OK, both of those reasons make sense, but why did it take so long for us to get savvy to them? A lot of that has to do with the rise of American—in particularly Southern—cuisine. Even though Knowlton was raised in the South, he hadn’t experienced brisket until he was 25. But that’s simply no longer the case; barbecue has made the leap from regional to a national obsession. 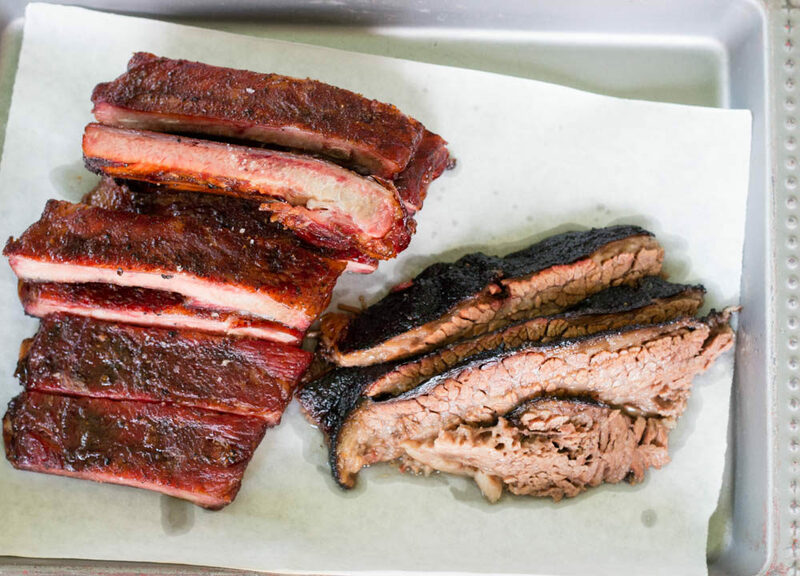 “If you go to New York and you go to Hometown, or you go to any of those places in Charleston, they’re all doing ribs, pulled pork and brisket. They’re everything to everybody,” Knowlton told us. 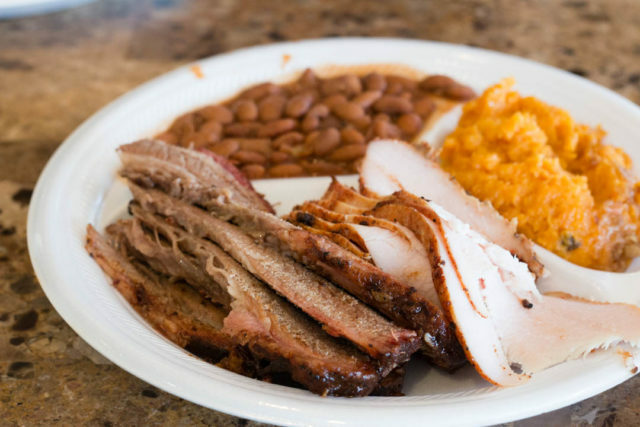 The two meat plate (brisket and turkey) with pinto beans and sweet potatoes. Photo by Garrett Heath. Similarly, there has been a rise in the popularity in bourbon, which I attribute to the popularity of Mad Men (yes, I know that his drink was Rye, but I think it spurred the craft cocktail movement at large and bourbon was a central player in it). Knowlton recalled that it was not too long ago that you could find a bottle of Pappy Van Winkle gathering dust in any old run down liquor store. 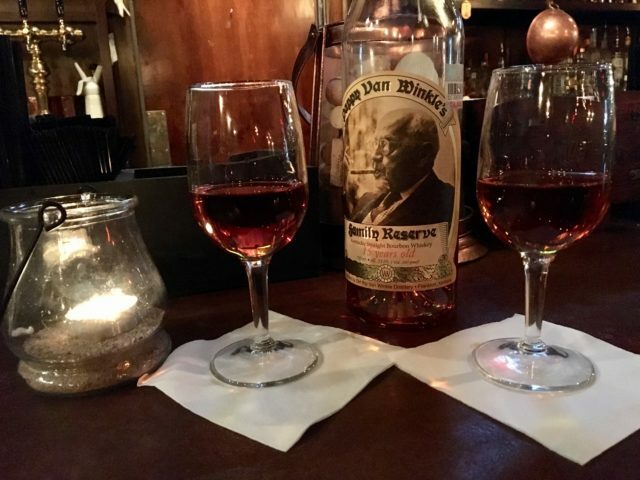 Today, you’re lucky to find it in a bar without breaking the bank—though my friend and I did locate some 15 year old Pappy at CU29 that didn’t cost an obscene amount (note: I didn’t say expensive, I just said that it wasn’t obscene). A nice pour of 15 year Pappy Van Winkle at SXSW. Photo by Garrett Heath. Timing could have been everything—the fact that bourbon and barbecue were trending at the same time may have done more for the pairing than the flavor profiles. Regardless if it was rise of both these Southern staples—and the fact that everyone wants to be Don Draper—I don’t care. I’m glad that they ended up joining forces. This was the brisket buried under all the meat! Photo by Garrett Heath. But one of the best pieces of advice was to not over think everything. Sometimes the best barbecue is served from the backyard or front porch, and the best bourbon is the bottle sitting on the shelf after a long day. While we have elevated both items—and undoubtedly have benefited from the higher quality that’s come from doing so—it’s ok to get back to the basics. Based in Louisville, Lee said that journalists and writers often ask him to take them to the best bourbon bar in town. He said he gets them in the car and drives them to Freddie’s, a dive bar that’s been around fifty years that’s owned by a World War 2 vet and doesn’t have any bourbon more than ten dollars. In fact, he tells them to order a $3 shot of Log Cabin and barbecue potato chips. Forget the Pappy, I’ll raise a glass of Evan Williams to that!